The colors of the 90th Infantry Division were uncased for the first time on August 25, 1917 at Fort Sam Houston in San Antonio. The new National Army Division, comprised of draftees from Texas and Oklahoma, would train in and around San Antonio before joining the fighting in France. On August 25, 2017 the colors will be uncased again in a ceremony at Fort Sam Houston recognizing the anniversary and the elements of the 90th that continue to serve our Nation. 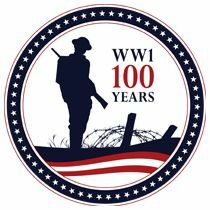 The 90th Division fought in the Meuse-Argonne offensive and at St. Mihiel in 1918; losing 1,488 soldiers killed in the fighting. The ceremony will be held at the historic Quadrangle at Fort Sam Houston at 8am on August 25. The event will be hosted by Joint Base Fort Sam Houston (Joint Base San Antonio) and the U.S. 5th Army. A band will plan WWI-era music and a color guard in period uniforms will be part of the ceremony. Lieutenant General Jeffrey S. Buchanan, Commanding General of 5th Army, will be the senior officer speaking at the ceremony. My father was a Medical Doctor in the 9th CAVALRY. 1942-1944. He was born in 1916.